Brewers often joke that they spend more time cleaning than on any other aspect of the job. That isn't quite true at Sapwood Cellars, but the cleaning aspect has been the biggest change from homebrewing. By comparison, wort production hasn't been that difficult or different. Sure it took a few batches to acclimate to the efficiency and losses on our 10 bbl Forgeworks brewhouse (as with any new brewing system), made more challenging by an unreliable flow meter. Even 15 batches in despite hitting our target mash temps, wort fermentability seems to be lower than expected. We're also still dialing in hop utilization given the thermodynamics involved with large wort volumes. 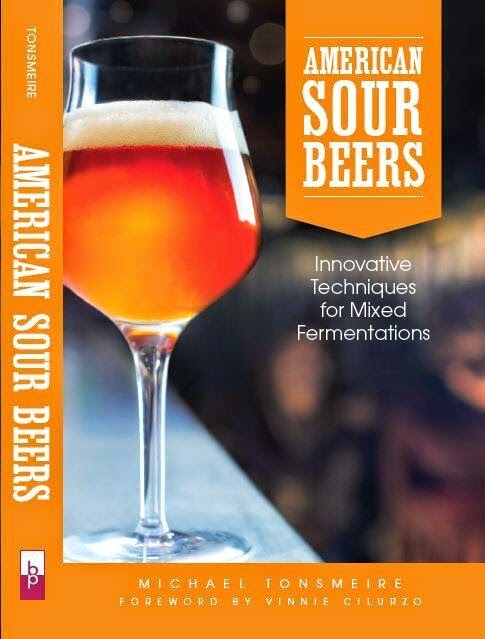 Still, the concepts, ingredients, and techniques are all pretty similar to homebrewing. When it comes to cleaning and sanitizing though, we've had to relearn the entire process. You really can't fill a fermentor with 360 gallon of Oxiclean Free and soak overnight or swirl and scrub... I miss those days. First, let's talk about chemicals and what they do. Our main supplier is AFCO, but Berko, Five-Star, and Loeffler all have fans. Prices seemed similar, we just didn't think about ordering until a couple weeks before we started brewing and picked the one with the quickest turnaround time. We buy most of the chemicals in 5 gallon jugs, and pump them into beakers to measure and dose. Caustic (5229 Caustic) - Caustic is the primary cleaner used by most breweries. Usually sodium hydroxide based and heavily alkaline. It is ideal for breaking down and removing organic deposits (e.g., krausen rings). You can do a bit of trading-off between time, temperature, pressure, and concentration. That said, 2-3% caustic at ~150F (66C) for 20-30 minutes through the sprayball has been a pretty good place to start for us. Caustic is dangerous because it is capable of breaking down your skin (the lye used in soap making is similar). We started with a powdered caustic (Wash-It), but given the price and efficacy we transitioned to liquid. Phosphoric-Nitric Acid Blend (5397 Microlex Special 30) - Acid helps to remove inorganic deposits, i.e., beerstone (calcium oxalate). It also helps to neutralize any residual caustic (not that there should be any with adequate rinsing) and to passivate stainless steel. Acid blend is used at similar temperatures and cycle lengths as caustic, although slightly cooler, ~130F (54C). Five Star Peroxyacetic Acid (PAA) - While there are many sanitizers available, PAA is the most popular for breweries. At the right concentrations it is a robust sanitizer with high effectiveness. It breaks down to acetic acid, so it can be used no-rinse. It is a powerful oxidizer, which makes it important to drain any residual before fermented beer enters a tank or keg. Our bucket was leftover from the old brewery in our space, so we bought a pack of test strips and it still reads the expected concentration after dilution. Five Star PBW - We have a bucket of this alkaline powered cleaner for soaking hot-side equipment and other gear where we don't want to have to be as careful as we would with caustic. We both used it at home, so were more comfortable with it than the Chlorinated Manual Cleaner we started with. Iodophor (4330 Spark I2) - Similar to the PBW, it is nice to have a less hazardous sanitizer for spraying ports or soaking fittings. It is only effective on clean surfaces, so it is important to remove of detritus before expecting it to work. Grain Alcohol - Given its quick kill times and evaporation ethanol is the ideal sanitizer for spray bottles and any surfaces that are highly sensitive (e.g., yeast culturing). Isopropyl alcohol is another option. Pre-Heating - At this scale a tank has so much thermal mass that you can't simply put 15 gallons (57 L) of hot water to a tank and expect it to still be hot after circulating. As a result if you want the caustic or acid to stay hot, you need to pray hot water into the tank. A tank with an electric element (like our keg washer has) helps too. Sprayball - Most tanks have a port that leads to a sprayball, a small metal orb that spins and sprays when liquid is forced through. These aren't always perfect, and can have blind spots, especially in ports and above it. In addition, it isn't effective at cleaning its own exterior. Passivation - This is what makes stainless steel stainless, a thin layer of chromium atoms at the surface that prevents iron from rusting or leeching into the beer (which weakens the equipment and shortens its lifespan). With a pristinely clean surface, the oxygen in the atmosphere is enough to accomplish this, but acids (especially nitric) are more effective. These chemicals aren't anything to joke about. Many brewers have scars gained from caustic or acid dripping onto their skin . Safety glasses, long gloves, chemical resistant boots and pants are a must when handling them. Read the safety data sheet for each chemical you are using and know what to do if some gets on your skin or in your eyes. I don't get to drink as much beer as I used to because the end of the day is usually the most dangerous time. Scott and I prefer to have all of the tank's arms connected from the start, allowing us to use valves to direct the flow of the cleaning and sanitizing solutions. We started off using a manifold coming off the pump, but have changed to daisy-chained T's between the arms. Many brewers prefer to simply move a single output line from the pump between the arms. This requires less setup time, but more active effort once cleaning begins (moving the hose from arm to arm ~10 times through the process). It also carries additional risks if you move the hose without closing a valve. 1. Once the beer is out of a tank, we turn off the glycol jackets and open the dump valve. We then shoot high-pressure cold water through the sprayball to remove most of the hops/yeast struck to the sides and bottom. 2. 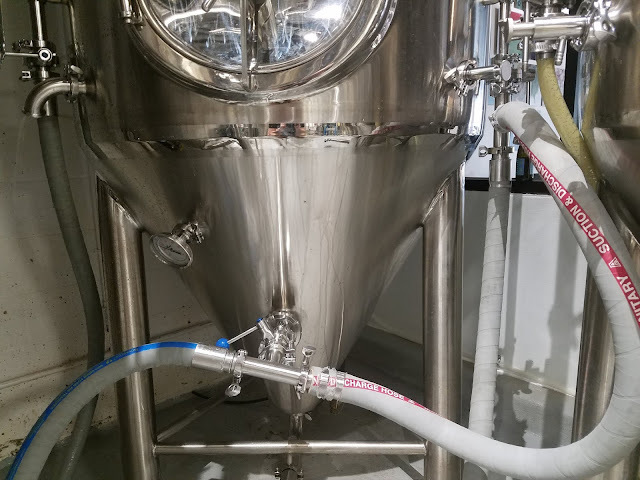 We use our on-demand hot water heater to generate 130F (54C) water to spray through the sprayball and manually through a hose to dislodge the bulk of the crud stuck to the sides/top of the fermentor. We'll run it through the pump to get good coverage. 3. We briefly remove the lower fittings on the tanks (including manway, racking arm, thermometer, sample port) to spray out the trub caught in them. 4. We blow compressed air through the sprayball at ~30 PSI with the bottom valve open for 30 minutes. CO2 neutralizes caustic, so best to remove as much as possible before proceeding. This long is likely overkill for a 10 bbl tank, but can't hurt. 5. We assemble our cleaning rig, usually a pump running to the sprayball, with a T to connect it to the racking arm and another to the blow-off. 5. We preheat the tank for a couple minutes by spraying 160F (71C) water in and letting it drain. We hook the water line in right before the pump so we can immediately go to cleaning once it is preheated. Our goal is to get the tank to read ~130F (54C). 6. We then use the hot water heater's built-in meter to send 10-15 gallons of 160F (71C) water into the tank. We dose in 3 oz of caustic per gallon (2.3%) using a stainless steel elbow on one of the ports (chasing the caustic with water to ensure it get in). We then turn the elbow down to allow that port to equalize the pressure inside the tank, while preventing caustic from spitting out. 7. I like to send a little flow through the blow-off and racking arm first to soak them during the 20-25 minutes sprayball at full pressure (60 hz on our pump - or a bit slower if it cavitates). Then five minutes through the other arms, before a final five through the sprayball. 6. Dump the caustic. Rinse each arm with hot water, then burst rinse 10 times for 10 seconds at 130F (54C) through the sprayball, allowing it to drain before each successive rinse. I'll often put 10-15 gallons (38-57 L) into the tank once or twice and recirculate at the end to make sure there is enough pressure to spray all the surfaces. You can check the pH of the drained rinse water to ensure it has returned close normal before proceeding. 2. We then take off all of the fittings (including the sprayball itself), soak them in PBW or caustic. We inspect the fittings and gaskets, rinse and put into a bucket of iodophor. For the ports we spray, scrub and spritz with iodophor before reassembling. We also take the chance to inspect the interior with a flashlight to ensure there are no deposits. 7. We run acid blend at 2 oz per gallon (1.5% by volume) using roughly the same process and times as the caustic. Significantly higher concentrations should be used on new equipment and once a year to ensure adequate passivation. 8. Usually we'll air-dry at this point unless we need the tank the following day. In that case we'll rinse and then sanitize with peroxyacetic acid in cool water at 200 PPM using the same rig, and pressurize the tank to 4 PSI of CO2 to ensure it holds. The next morning we'll dump any residual sanitizer from each port before running wort or beer in. The whole process including sanitation takes three hours, but most of that time isn't active (just waiting for a purge, or cycle). Going longer on any of the times isn't a big deal, so it is easy to run while working on other things if you keep track of your progress and don't miss a step. We haven't gotten a CIP cart with dedicated vessels and pump, so our biggest issue currently is that it is difficult for one of us to clean a tank while the other person brews because they require some of the same equipment. Luckily our current schedule of two batches a week doesn't make that too much of an issue. I am by no means holding this up as a perfect or ideal process. It'll likely be viewed as overkill by some, and inadequate by others. But if you have constructive suggestions, I'd love to hear them! I'd rather err towards overkill because we're dealing with several yeast strains (including killer wine yeast, Saccharomyces cerevisiae var. diastaticus, not to mention Brettanomyces and Pediococcus in a dedicated tank), although we do have the advantage of only dealing with kegs stored cold. We addition we'll pump the same chemicals through our heat exchanger and carbonation stone. For the heat exchanger we also heat pasteurize by running 180F (82C) water for 20 minutes inline once we assemble our knock-out rig (we discard the water until we see wort before sending to the fermentor). 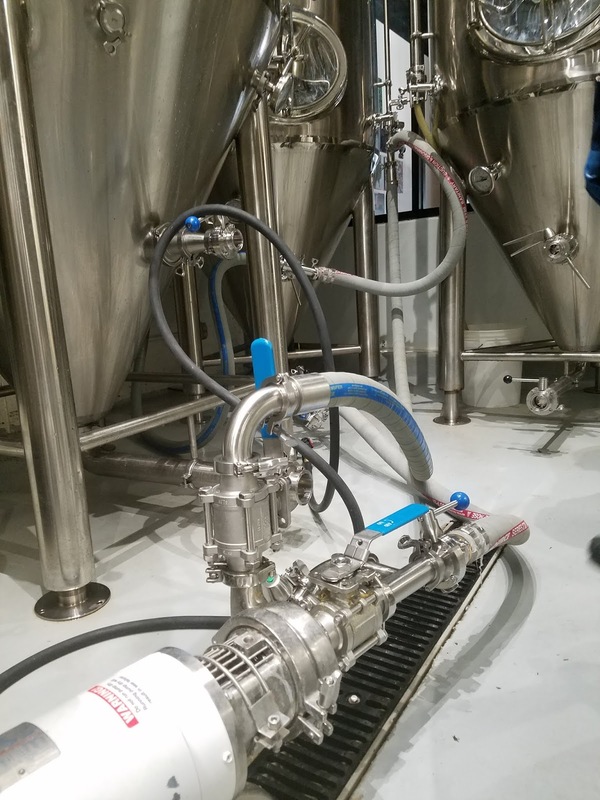 Our keg cleaner automatically does the same process on our sanke kegs, including air and CO2 purges to recapture the caustic and sanitizer. Cheers! I'm amazed how little "practical" advice there is out there from commercial brewing. Lots of forum posts with conflicting info. Most of the books are heavy on theory. Hey Mike, as a fellow home brewer that is making the leap to starting my own hoppy/brett/sour brewery, stuff like this is a godsend. I wish you guys all the best at Sapwood Cellars and I hope to make it down from Ontario some day to try it out! I would like to know if you always do the acid blend circulation, people often says it should be done only a couple times a year because it slowly degrades the inox and just serves as a passivation or beerstone solution. Some breweries even do it once by quarter. We've been doing it each time, but several brewers have suggested reducing to monthly. Something we'll likely go to. I love these details of commercial brewing. How do you keep clean the exterior surfaces -- floors, walls, ceilings, exteriors of fermenters, pipes, etc.? I don't have a good sense how careful you need to be in a large scale brewery about dust and crud coming in from the outside. I realize there are some places that do open fermentation, so the job can't be impossible, but I don't have a good sense of how much regular cleaning is involved and how it's done. I agree, keep up the good work and thanks for the tips. For the pad, we hose-down and squeegee usually at the end of the action. Mop more infrequently. I spray down the exterior of the fermentors after cleaning the inside (remove any caustic or beer that may gotten on them). Once a month I try to polish the tanks and inspect (looking for rust or grime). We've got a window looking in on the brewery, appearance matters there too! Otherwise we just try to keep the space clean to avoid having bug/rodent issues, mold, mildew etc. Good call on the no-rinse sani. We use iodophor at work and even though we have never (to my knowledge) had a (perceptible) fermentor infection from rinsing, it definitely makes me anxious just on principle. It does seem that a lot of sani/cleaner choices are pretty arbitrary and often hinge more on availability than the products themselves. We use iodophor simply because our kitchen chemical supplier already stocks it, so no separate order has to be made. Huh, never thought of using compressed air to push out the CO2. Every brewery I've worked in utilizing tanks 40bbl and under just let it air out for 20-30 mins, the rinse after more or less pushing out everything else. The bigger brewery I worked at with tanks 50-1200bbl we used a vacuum fan. I would listen (if you haven't already) to the master brewers podcast on the effectiveness of sanitizers in the brewery. The brewery I work at does not use Iodophor and after listening to the episode I'm fairly happy we don't as it does not seem very effective. I recently wrote an standard operating procedure for cleaning our FVs and it looks very similar to this post. The main difference would be that we use hotter water and thus slightly shorter times and are circulating through the bottom port while draining out of the racking arm with a sample spout attached into a bucket full of tank parts (we have extras of everything) so when the CIP is done so are all the parts. If in a time crunch we can clean a tank in right around an hour. Given my experience I would say you are definitely erring on the overkill side, but given your yeast/bacteria tendencies I agree with you, it seems like the right side to err on. The main downside to this other than time is water/chemical waste which isn't great for the environment. Anyway, good to see another post! Interesting to hear how you things. On the side of practical things: We often do something the cleaning expert suggested to us to get rid of the CO2 in the tank. He calls it sacrificial caustic. Basically, we repurposed an old small fermenter (about 1hl in our case) as a movable liquid holder. Once the caustic has run through a tank we don´t dump it, but just put it through another fermentor which only had the door open for a bit. The caustic gets neutralized, but takes CO2 with it and already does a bit of cleaning. Since the neutralisation also has somewhat of that soda effect it is also good at getting at the yeast ring. The main caustic then has a little less lifting to do and gets used twice, so more bang for our buck. We can even sometimes use a lower concentration. Also, if the yeast ring proves sturdy we sometimes add a touch of Peracetic acid to the caustic for a short time performance booster using the same idea of that soda effect. Also good for the nasty burned wort in the inner cooker (don´t recall the English word right now). There it actually is standard protocol to use this method. Just DON`T use it in a plate chiller or so cause it releases gas which of course can be bad news in such a closed system. Curious about your Daisy Chain Method. Are there any issues with agitation points (When the liquid flows past multiple tee valves)interrupting the flow and effectiveness of your system? Thanks for chiming in Kiichi! No complaints on daisy chaining so far, liquid is pretty efficient and transferring force around corners it seems. Still best to go to the sprayball first, as that is where the highest pressure is required.